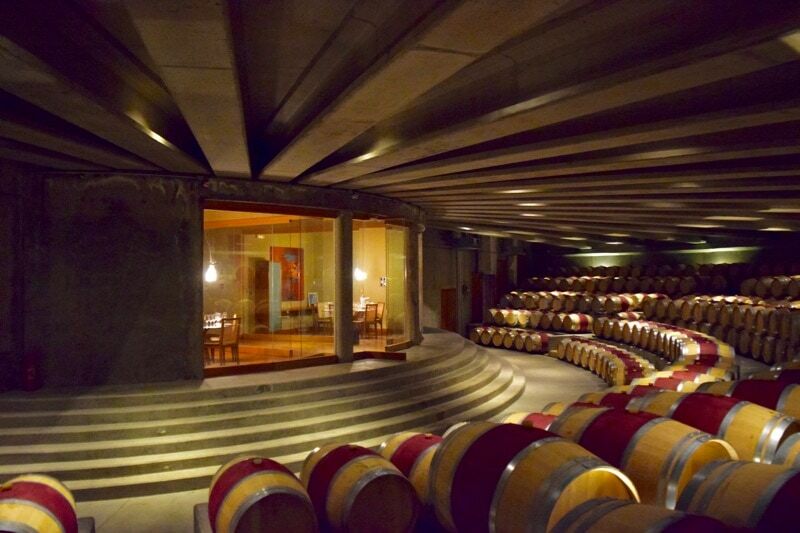 Feng shui, gregorian chants and delicious wines – Viña Montes in the Colchagua Valley isn’t your average winery. I could tell my other half wasn’t convinced, but sometimes when I have one of my ‘bright ideas’ it’s best not to question it. 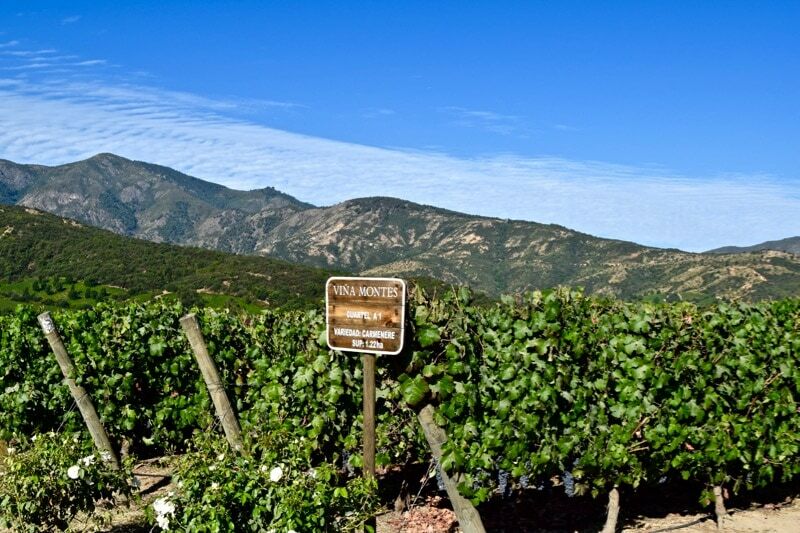 The plan: to walk from the town of Santa Cruz in the heart of Chile’s wine region, the Colchagua Valley to Viña Montes – one of the premier. 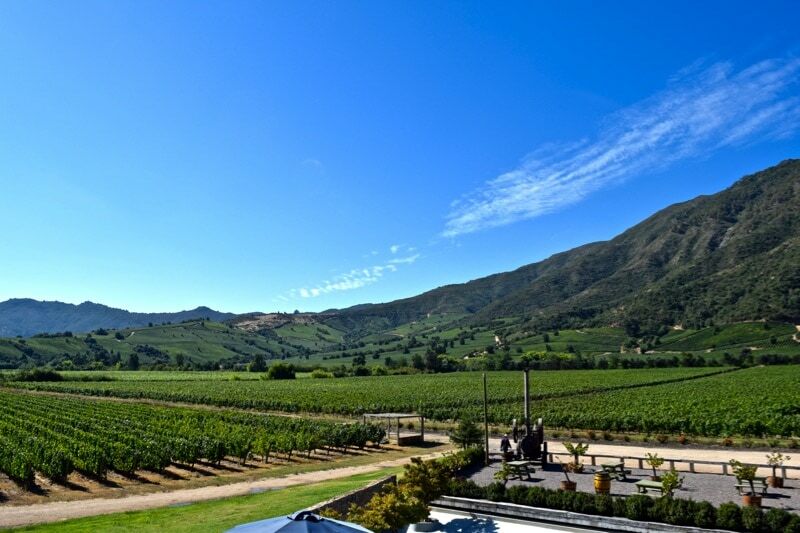 It wasn’t on our original plan, but the owner of our B&B said it really was one of the best places to go wine tasting in the Colchagua Valley. So off we went. Flash forward 20 minutes and we’d worked up a thirst, a sweat, and appeared to be wandering through an industrial estate on the outskirts of town. Mechanics attempted to rescue rusting old motors while construction workers hammered bits of metal. Not the best start to our romantic walk through the vineyards. 30 minutes in and we appeared to be on a hard shoulder. Cars, lorries and buses raced past, churning up dust and dirt, almost knocking us over with the motion. Lining the main road – lush green vineyards and fields of fruit trees separated from us by hedges, fences, and, at one point, a rather ferocious looking dog. We continued our sticky hard shoulder wanderings until we spotted a bus which took us a little closer, before being picked up by a friendly local who saw the universal hitchhiking sign – the thumbs up. He kindly dropped us at the entrance, and an hour and a half after leaving Santa Cruz we made it to Vina Montes in Apalta. 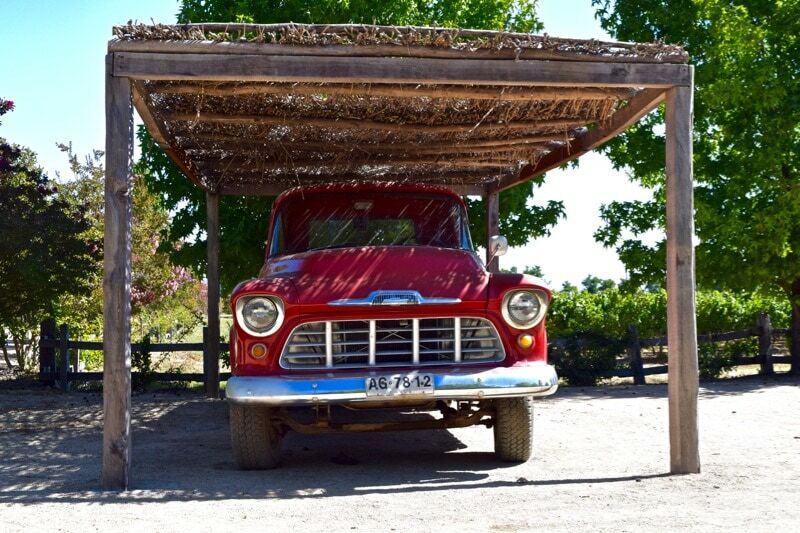 I prayed that they wouldn’t judge our appearance as we arrived for the wine tour… and that it lived up to our B&B owner’s recommendations as the best wine tour in the Colchagua Valley! It was a striking setting; beyond the rows and rows of vines was a flat roofed architectural dream of a building, with something reminiscent of a moat and drawbridge leading to an enormous front door. If Disney produced wine, this would be the fairy-tale vineyard! 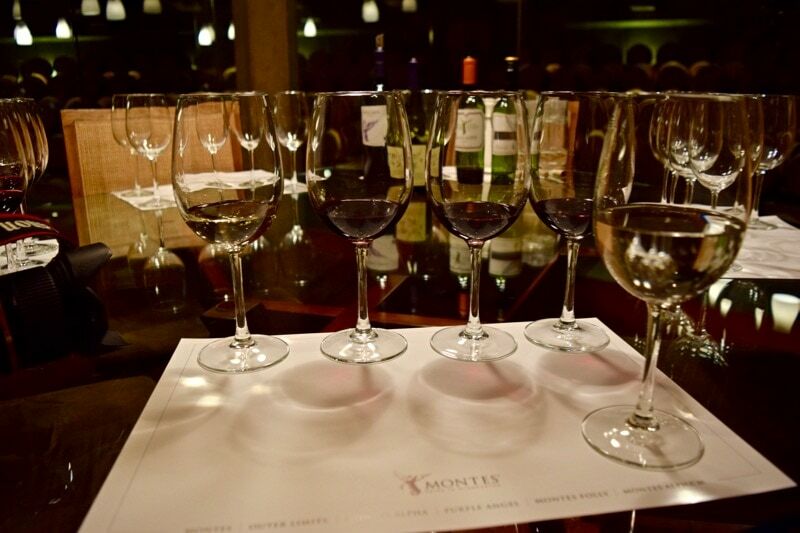 Little did I know, water was a key feature of the Montes experience… but hang on, weren’t we here for the wine?! I’m no connoisseur but I love wine. I love its ability to enhance food experiences, and its place in social situations. I love a glass of prosecco to kick off a celebration, a glass of white with fish and a glass of red in a country pub with a hearty roast dinner. 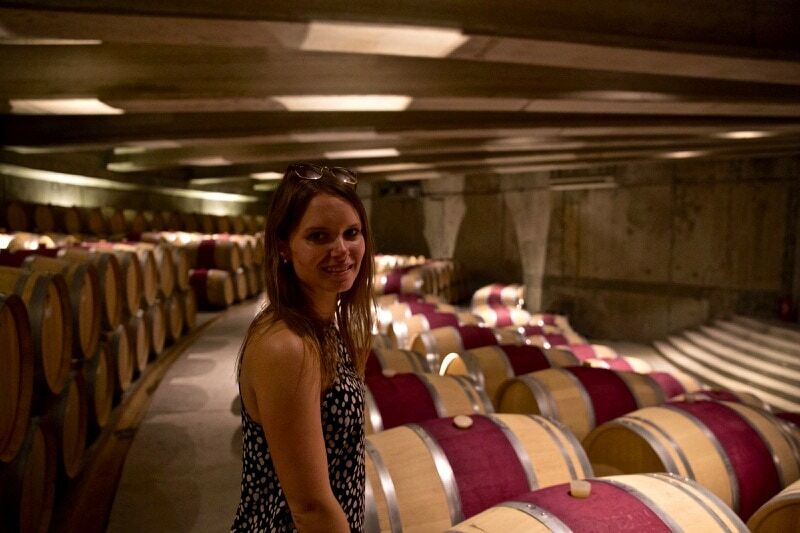 This love has taken me on several wine tours, yet I’ve retained rather limited information! 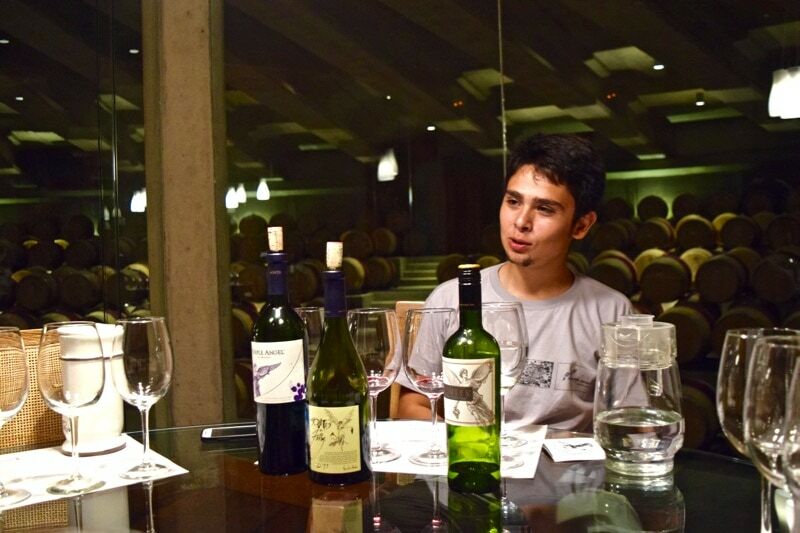 Wine was our main reason for visiting the Colchagua Valley, and we were damn well going to learn something! 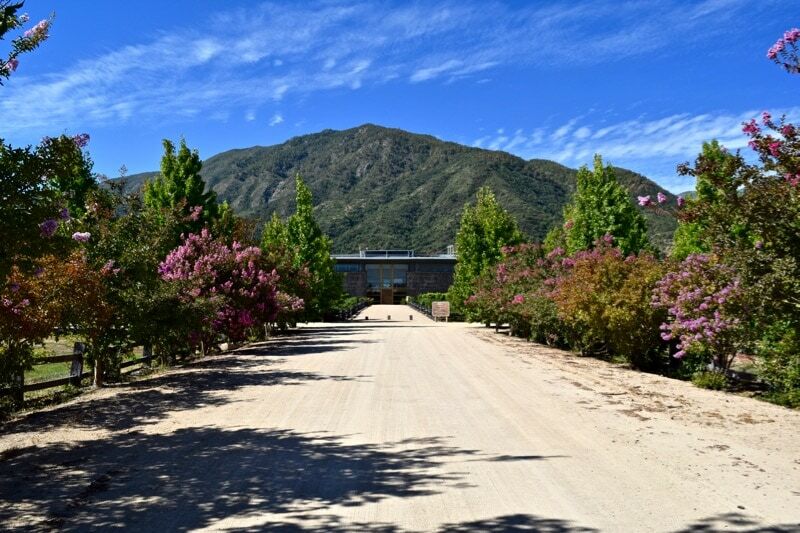 Joining a tour of the winery led by Sebastián, a young Chilean full of passion, we heard how Montes was founded by four friends in the late 80s. 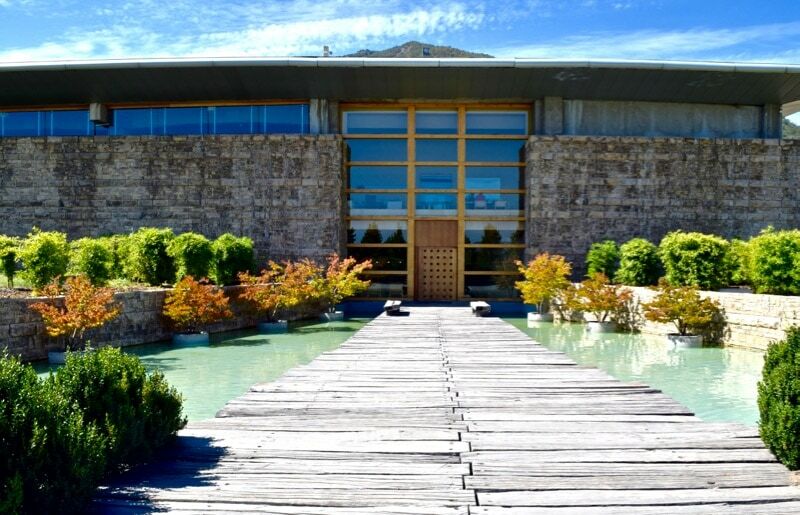 The skilled entrepreneurs were united by their love of wine and belief in Chile’s ability to create a top quality product. With their combined knowledge of agriculture, wine making, finance and marketing, they knew they had a real shot. 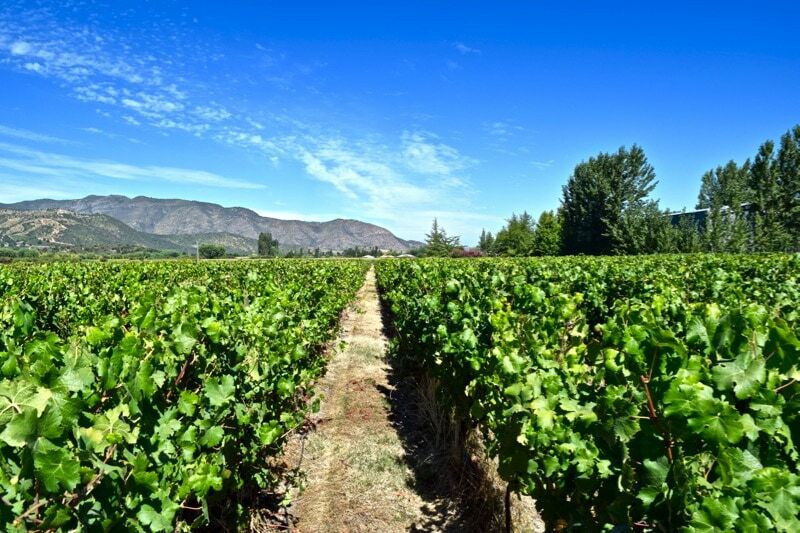 At the time the country was more famous for making average quality table wine, so it was quite a coup when they developed the first premium Chilean wine. 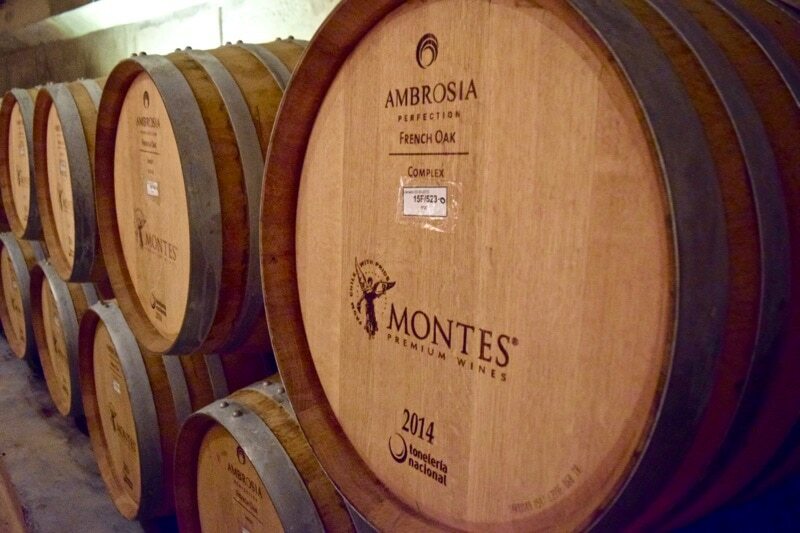 Named Montes Alpha, it won several awards and Montes was named ‘Winemaker of the Year’. 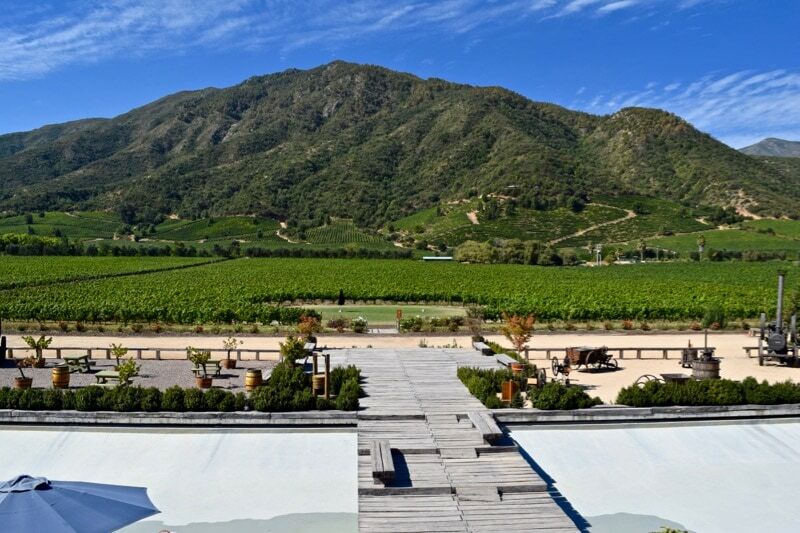 As we looked out from the back of the building to the sloping vineyards, flanked by mountains and topped with a bright blue sky, it was hard to imagine a more spectacular spot. But why is it great for wine? Apalta’s long hot summers create grapes with thicker skins, deeper colour and they’re packed with sugar. I actually plucked a couple of grapes from a vine (shhh don’t tell!) and was surprised at how sweet they were. Plus, the surrounding mountains protect the crops from insects and disease. 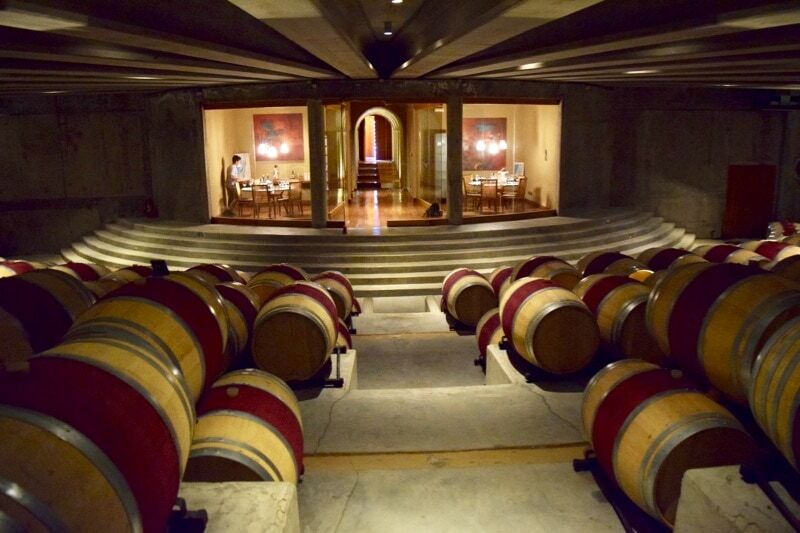 My favourite spot was down in the amphitheatre style barrel room, where around 1,000 barrels lay on their sides listening to eerie Gregorian chants. The low, slow vibrations are believed to impart positive energy. Singing to wine – whatever next? Perhaps they should play some drum and bass and see what effect that has?! 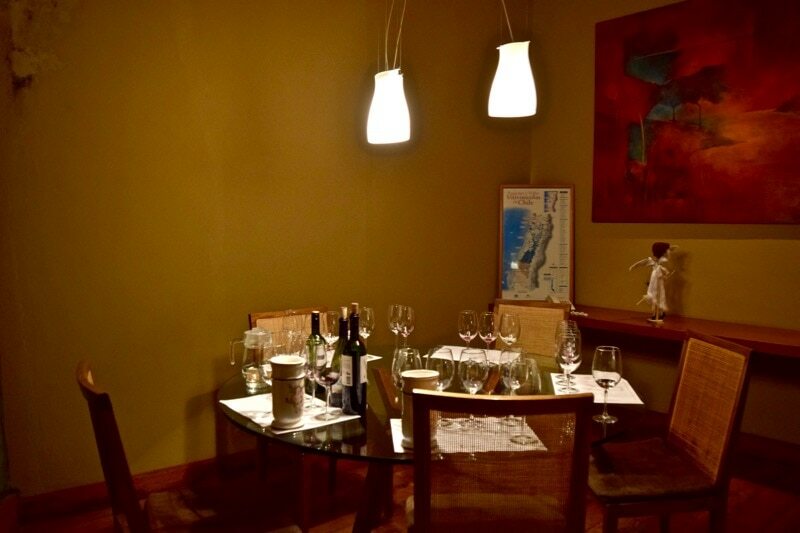 After a tour of the restaurant, vineyards, production area and barrel room, we headed to a side room for the wine tasting. We learned about the production process, top sellers, and Sebastian told us a few weird and wonderful facts along the way. Water was a prominent feature both in and around the building. Why? Well, it’s all down to feng shui. The water outside flows towards the building, sending positive energy indoors. Rock and wood were dotted throughout – wood associated with motivation and inspiration, while rocks take care of stability and security. 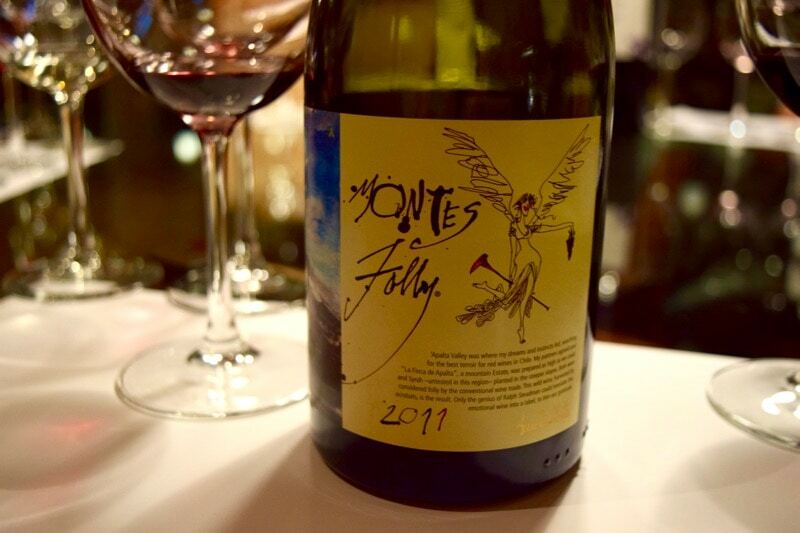 Montes is a winery with a social conscience and a heart. Can you believe it’s carbon neutral? There may be some hefty processes going on, but they’ve created a balance with plenty of trees to absorb the CO2 produced. 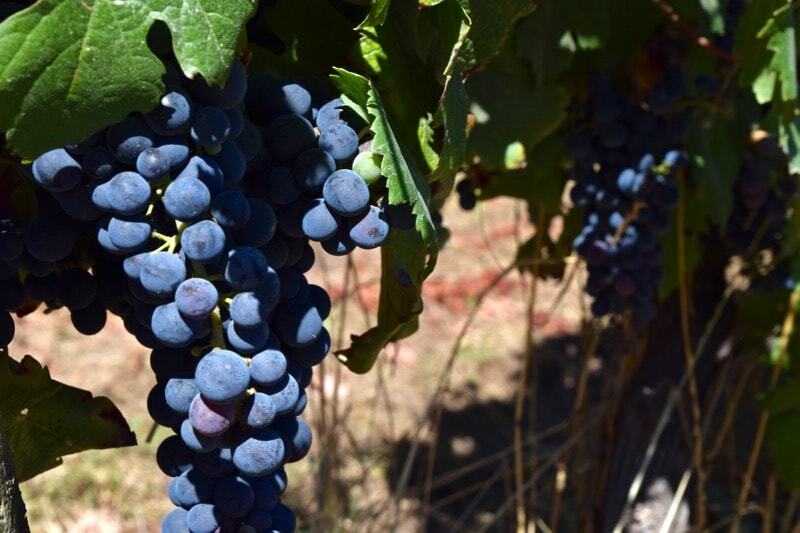 Across their 200 hectares of vineyards, over 350 animals (mostly sheep and llamas) help control weeds, virtually eliminating the need for herbicides. 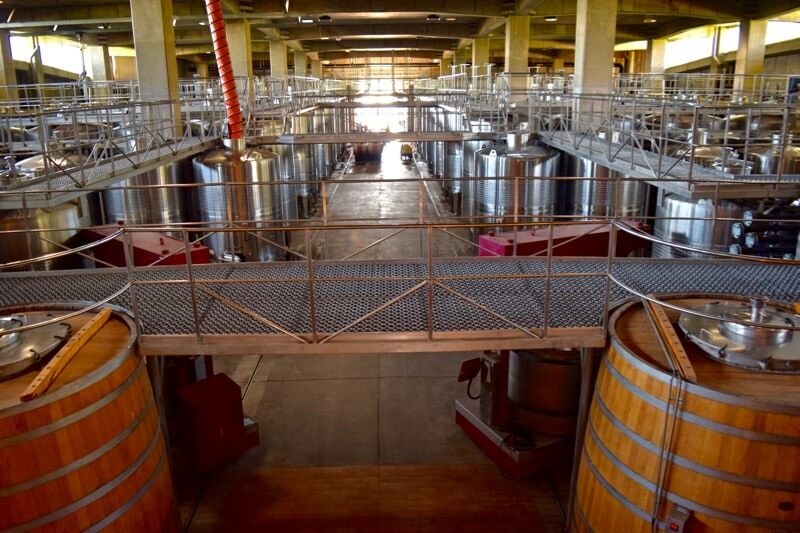 From what I could surmise, it was a company producing great wine, while protecting the future of the industry. Along with the feng shui and the eerie chanting, there was another theme. Angels. Considered a symbol of protection, they weren’t just in statue form, but also as a logo on each bottle. 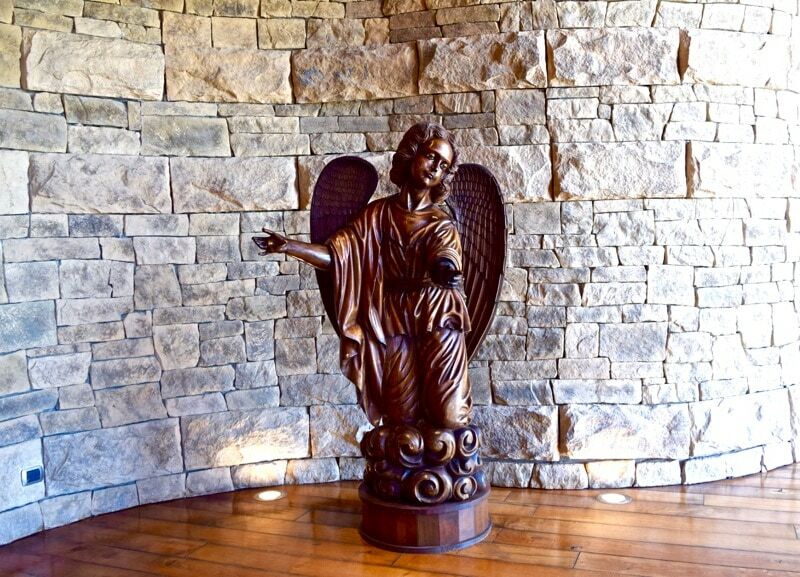 Most had the typical sweet, virtuous, appearance, but I was particularly attracted to ‘Folly’ where the angel seemed to have adopted the role of the drunken rebel sister! Penned by the illustrator of Pink Floyd’s album cover for The Wall, the Folly labels had become collector’s items. 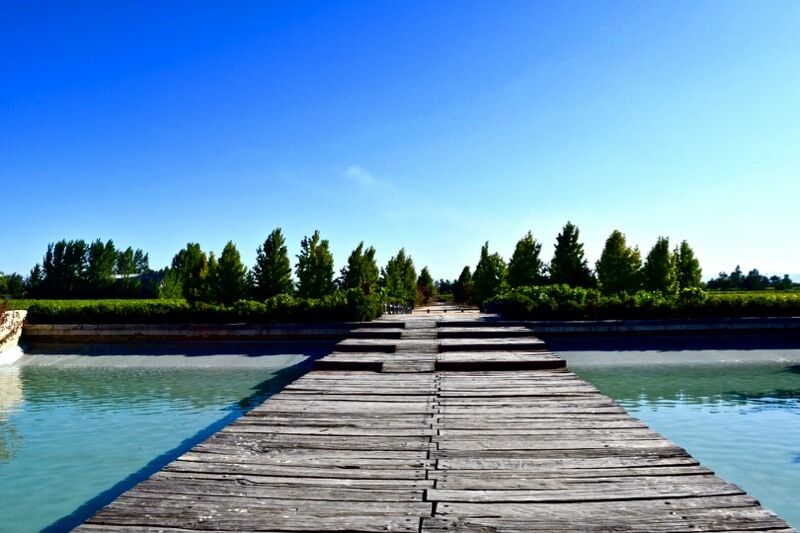 The wine tasting room smelled boozy – heady tannins hitting me as I entered. 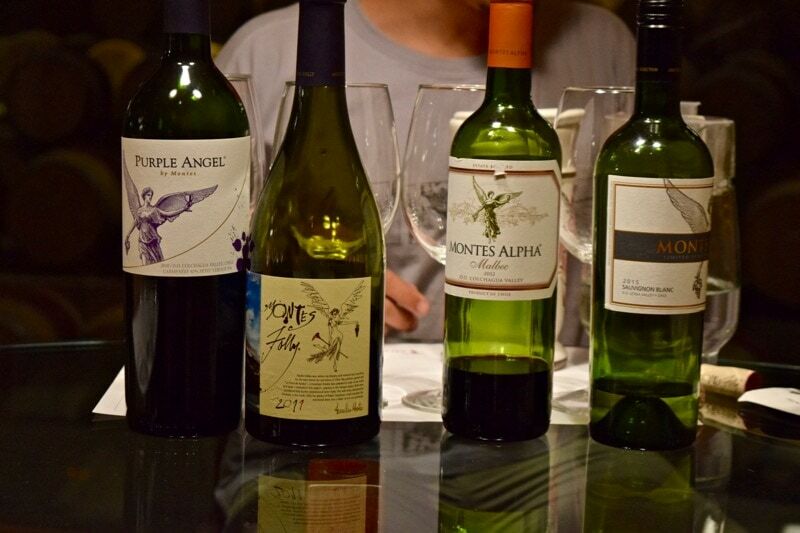 I swilled some water around and prepared for the wine tasting. Over the next 40 minutes, we sampled four signature wines kicking off with a citrusy, tropical sauvignon blanc from Montes Limited Collection. Next up a delicious, smokey malbec from the Montes Alpha collection. Malbec is my go to wine in the UK as I’m a big fan of it’s deep, bold, smokey, flavour. 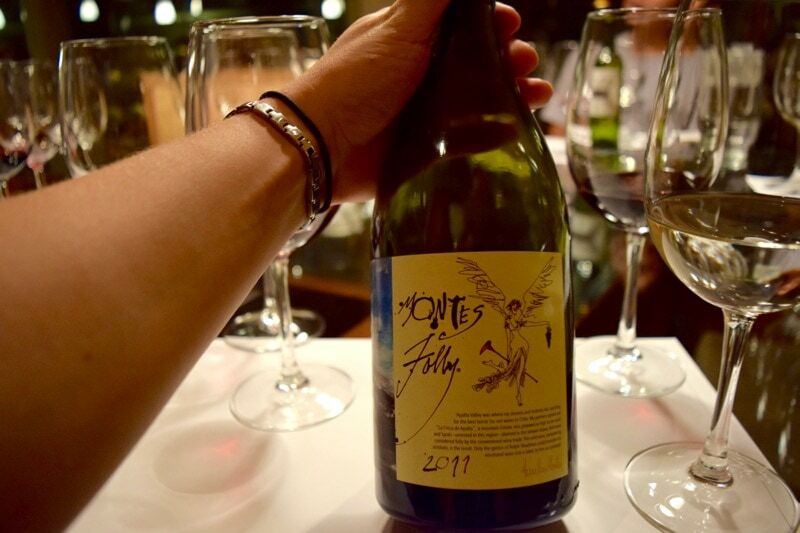 We had the pleasure of tasting a Montes Folly from 2011 – a shiraz wine never that has received endless praise. I started to feel I had something in common with the drunken angel on the bottle! The mature red, with a strong flavour of berries, happened to contain the most alcohol – a boozy 15%! 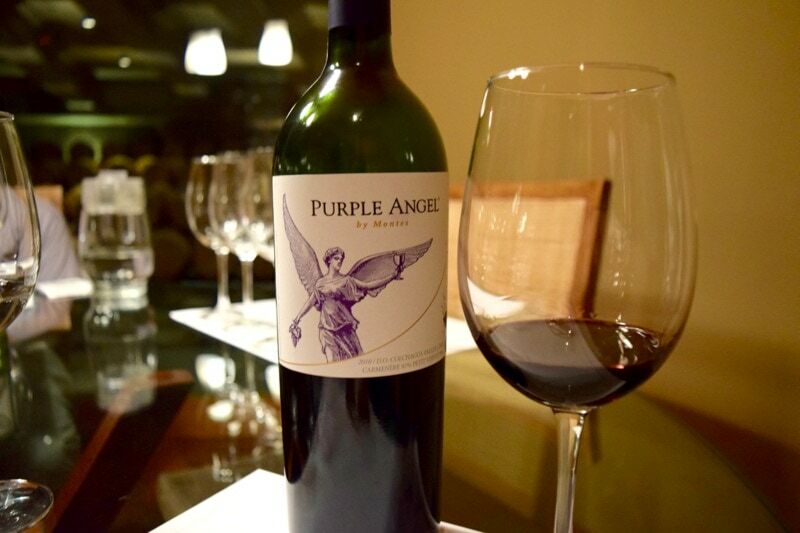 We finished on a Purple Angel carmenere which was smoother, spicier and easier to drink, or perhaps that was the booze talking?! 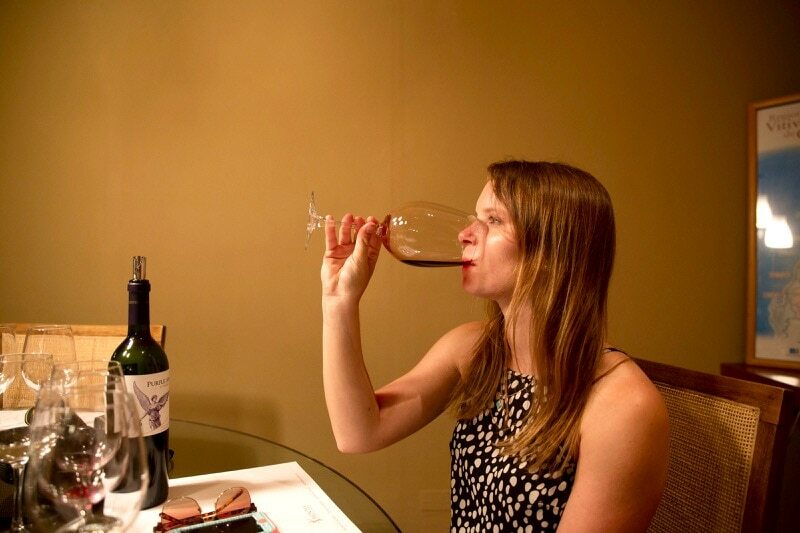 A wine tasting of four wines costs CSP $10,000 per person (approx. 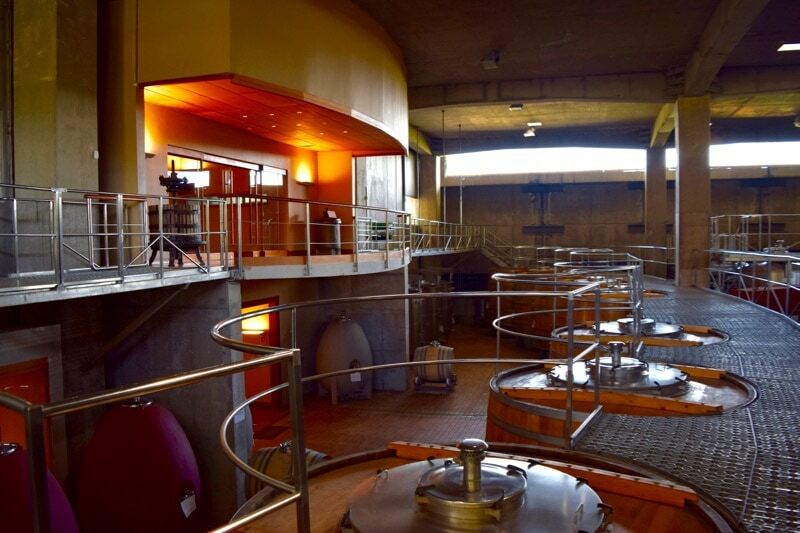 £10) or a private tour of the winery with tasting costs CSP $60,000 per person (approx. £60). 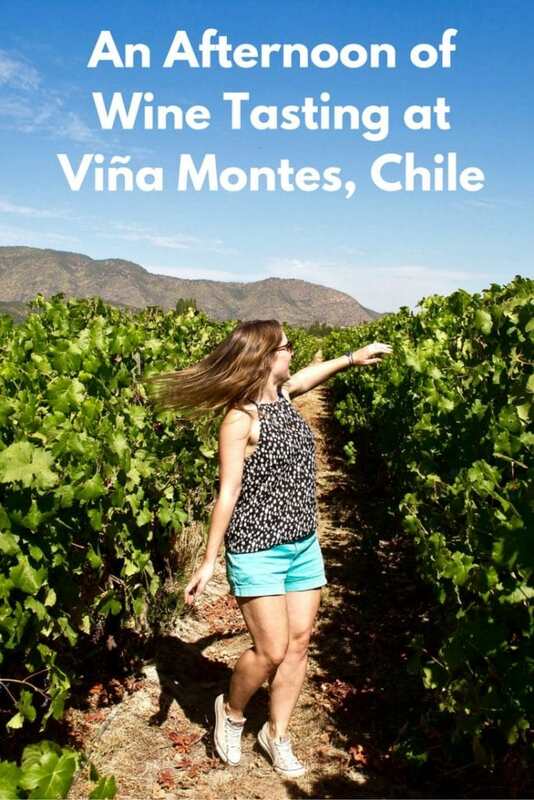 Find out about the different Vina Montes wine tours here. 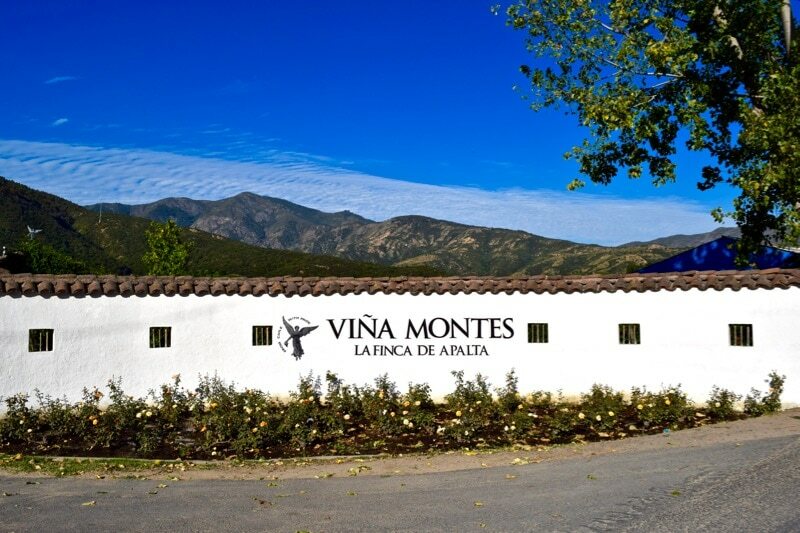 Thanks to Viña Montes for inviting us for the wine tour and tasting. 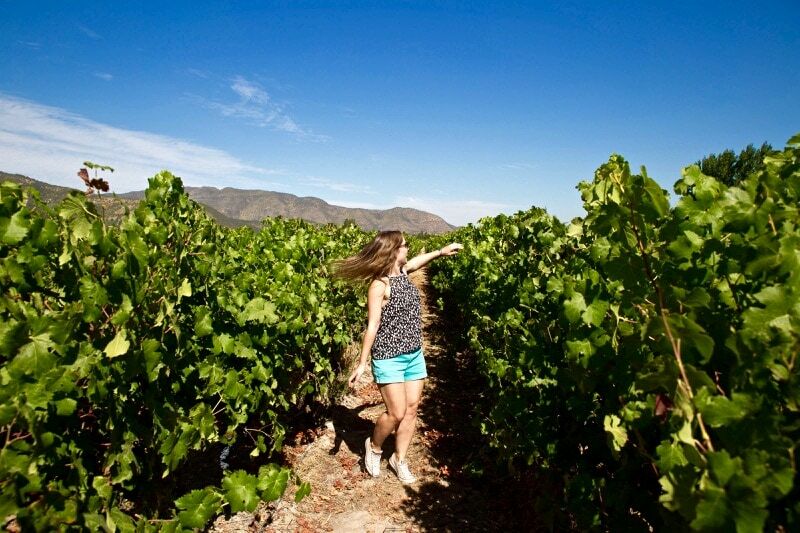 I strongly recommend this wine tour and would go as far as to say it is one of the best wine tours with tastings in the Colchagua Valley. As always opinions are my own!